As adults, we often associate the way children should react to a problem closely to how we should react. We raise them to approach life and situations in a similar way to the way we do. This is just the nature of being a parent and reflecting ourselves and our values onto them. However, this can be a critical mistake with parents when it comes to indoor mold. Children at any age from the day their born through early adulthood have developing immune systems. Prior to an immune system being fully developed and experienced with the many viruses, bacteria and other intruders that exist in our everyday world, it is in a weakened state where it’s very susceptible to the negative health impact of a variety of contaminants. Indoor mold is an often overlooked contaminant that can cause adverse respiratory conditions in children. These conditions can often result in lifelong ailments such as asthma, chronic bronchitis, chronic sinus infections and ear infections, and early age lung cancer. According to Rylander Etzel’s 1999 work titled Indoor Mold and Children’s Health, close to 25% of homes have an indoor mold problem that could pose a serious health risk to children and infants. Studies have shown that infants exposed to high levels of indoor mold increase their chances of developing asthma by age 7 (the age when asthma can be accurately diagnosed) by more than 100%. Mold has been linked to poor academic performance and health conditions from exposure at school (more about this below). Beyond the home, there are other environments where children spend their time that could be a problem spot for mold growth. Public schools, preschools and day care centers are a subject of focus since the average enrolled child spends over 30% of their waking hours in these institutions (6-8 hours per weekday). The concern is that many do not have the adequate maintenance budgets to repair leaks, and try to save on air conditioning costs, which can lead to mold growth. Statistics show that excessive moisture or mold growth in schools has been associated with an increased risk of asthma, upper and lower respiratory tract conditions, and infections. These combinations give children a high risk at developing a variety of health issues when exposed to indoor molds, and have given rise to several speculations on possible causes for other behavioral or physical conditions. If you suspect that your child is reacting to a mold condition at their school or care place, alert the administrators of the facility at all levels of your suspicions and ask them to investigate. It is their duty to provide a safe and healthy environment for your children. It is important to take preventative measures within the home to minimize the chance for mold growth to occur. Maintaining indoor humidity and moisture is crucial to prevent mold growth, which can be done by venting moisture-generating sources (such as the shower) to the outside, or using air conditioners or de-humidifiers. It is also imperative to control water damage or leaks within 24-48 hours to prevent mold growth, as well as discard any materials within the home that have any signs of mold growth. Expecting parents should be quick to correct any water damage or mold issue present in their home as soon as the mother is expecting and long before the birth of their child to protect respiratory complications in the infant due to mold exposure. If mold is suspected or visible within the home, it should be removed immediately to prevent any adverse health effects that might occur if allowed to flourish. Several environmental service companies are available to consumers and businesses to investigate areas of possible contamination. This is done by an on-site inspection and the collection of air and surface samples at the property. These samples should then be analyzed by an independent third party lab to detect the presence or absence of mold growth within the area in question. 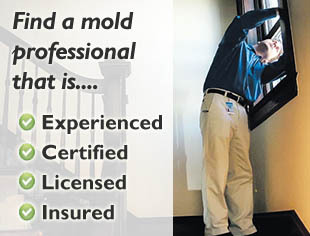 If a serious mold situation is discovered, be sure to use a certified and licensed mold remediation company. 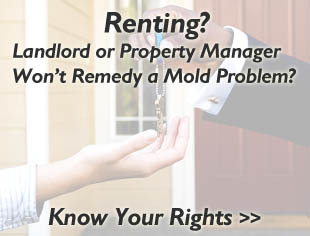 There are a number of contractors out there that claim they can remove mold, but do not have the training, equipment and know-how to properly remove it, treat it, and prevent airborne spores from spreading across your property. Heather is Certified Industrial Hygienist through the American Industrial Hygiene Association (AIHA). A Biology graduate of the University of California, Berkeley, she has dedicated her field of study to Indoor Air Quality (IAQ) with a focus on fungi (mold) and allergens such as dust and pollens.